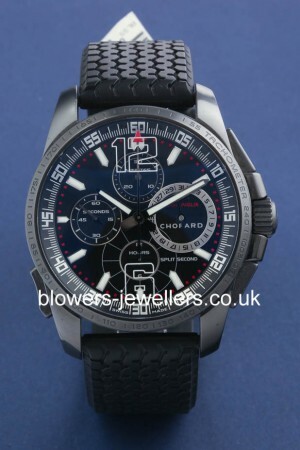 Chopard Mille Miglia GT XL Chrono Split Second 168513-3002. Limited edition of 1000 pieces. Automatic C.O.S.C. movement. Steel case, diameter 44mm wich is water resistant to 100 meters. The case is coated in DLC (diamond like carbon). Slate black dial with black sub dials and luminous index hour markers, and outer track markers. Featuring functions: Hours, minutes, small seconds, date, chronograph’s hand, 30-minute counter, 12-hour counter, split-seconds hand. Fixed bezel with tachometer scale. Black rubber strap with Dunlop tread with a steel double folding clasp. Box and papers dated September 2011. Our reference S15883. SKU: 3040025. Categories: Chopard, Mille Miglia.